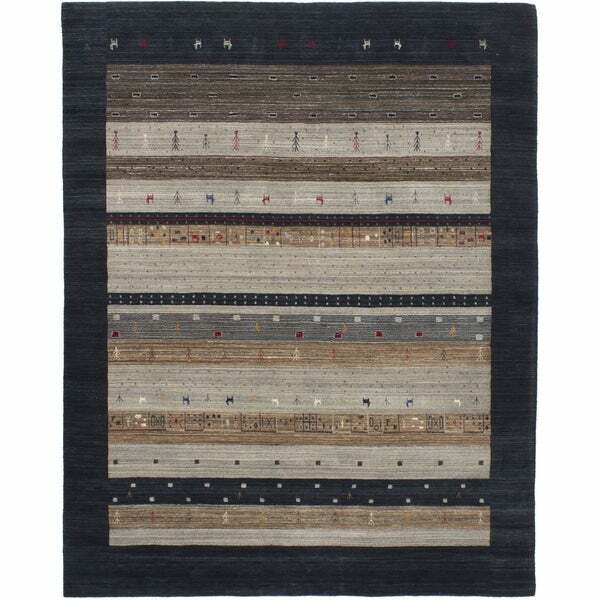 Grand Bazaar Orin Black Area Rug - 1'8" x 2'10"
Gabbeh tribal rugs are handmade with extra high pile and very simple, stylized designs. They are tightly woven from handspun wool and vegetal dyes, focusing on the use of vibrant earthy colors. The irregularities in the dyestuff and handspun wool result in a collage of similar hues, which gives Gabbeh their typical rich texture. Tip: We recommend the use of a non-skid padto keep the rug in place on smooth surfaces. Dimensions 120.0 In. X 96.0 In. X 12.0 In. Shahbanu Rugs Super Kazak With Gabbeh Design Hand-Knotted Pure Wool Rug (4'1" x 5'10") - 4'1" x 5'10"